TresCom Forums • View topic - TPDC! AHHHHH!!!!!! The scale is correct (thank god) but the Y and Z positions of the Alberta rig stored in TPDC do not appear to be correct. One thing I tried was making sure the Alberta mesh's pivot from Tres was centered, and it was. Basically the only thing I haven't tried is centering the pivot of Cerato but it seems to me that would only make it worse. Soooooo guys what is going on wrong here? Ahhhh hey thanks machf that's a great resource up there to have! And no, sadly I never got the time to make those things I referred to. All those previous ones are simply renames of Remdul's original RaptorB.alias file. In order to use thim with TPDC 0.2.2b (I think they won't work with previous versions, the format seems to have changed a bit), copy the code into separate text files and save them with the corresponding names, placing them inside the "alias" folder within the TPDC 0.2.2b install folder. For the following ones, I started with Remdul's RaptorB.alias file and modified it accordingly. 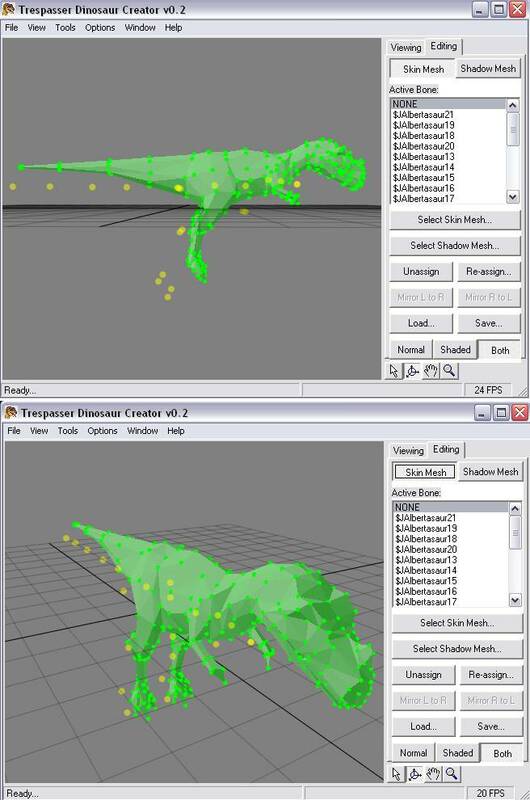 The T-Rexes share the same skeleton and the Albertosaurus, although having a different one, has the same number of bones and arrangement, so those were just a matter of making one and then renaming it for the other three. The format is quite simple: a string with the bone name, followed by a semicolon, followed by the description of the bone, followed by another semicolon, followed by the parent bone, followed by a semicolon, followed by the mirror bone, followed by another semicolon, followed by a number which I'm not quite sure what it is for... some ratio between bones or something. BTW, I had already noticed this earlier and didn't get to mention it, but this seems like the proper place... it turns out that four-legged dinosaurs also have two 'arms' -in other words, yes, they have six extremities in total-, but they aren't being used. The Compy could also have used another rename of the same alias file, but it doesn't have a shadow mesh, so it doesn't need the shadow alias file. And as they say, "that's all, folks!". Post subject: Re: TPDC! AHHHHH!!!!!! Downloaded the DLL pack thingy and put the files in the TPDC directory... Got the same error message before and now. What to do next? I also got that error recently when downloading the software. I ran it as administrator and it works when I do that. It is possible that when running the installer without admin permit, it will not copy the correct dlls to the windows folder.